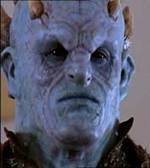 Greta Christina's Blog: GOP Candidates and Buffy Villains: Separated At Birth? Mike Huckabee: Caleb, or the old woman from "Where the Wild Things Are"
Ron Paul is the Mayor. I have to agree with the original post, which has Mitt Romney as the Mayor. It's a real stumper: which one is creepier? And I think Hillary Clinton is Professor Walsh. I don't care what you do with them, just wrap Spike in a tidy package with a carton of cigarettes and ship him to my bunk. That said, I think Dennis Kucinich is Jonathan, simply because he's short, smart and nerdy and I like him. The out-of-the picture incumbent president is Benjamin and his VP Cheney is Glory because Glory's power hungry and you never see the two in the same room together. Plus, I'd bet Cheney would give anything for a sassy red dress and a nice pair of Manolos. Huckabee is the Mayor. He seems sweet and avuncular, but we know better. Clinton is Dawn, because she annoys the hell out of me, but I know I may have to vote for her. Edwards is Giles at the end of season six. You might think he's not got a lot going on, but he could very well have a powerful coven backing him up somewhere. McCain is that demon that scared the hell out of the frathouse. Once they actually saw him, they realized he was only a few inches high ("Oh...it says 'actual size'"). Thompson is Principal Skinner - he wants to make the country a No Fun Zone. Guiliani is the Subway Slayer. Did a lot of good in NYC, lives in the past, and is, electorally speaking, dead. I like to think of them more as the seven dwarves' bumbling cousins, Or as peanuts characters. I never really got into Buffy. gassy (hot air)huckabee,Crusty (Mcain),preachy(thompson),delusional(guliani),Pappy( RPaul) ,twichy(kuchinich),DEPpy(ya'll remember from the 80's(Edwards), cheesy(Obama), and for Hilary I can't really decide on her or the others, and frankly It would be too long and I don't want to be a comment whore.